At this point you’ve gotten the message: “saving for retirement is important,” the question is, have your employees? Some of them certainly have, but what about those who aren’t saving enough for retirement? You could always send out an email blast reminding everyone to up their deferrals, but wouldn’t that just irritate the ones who are already saving enough? What about a one-size-fits-all message…that would probably sail right past the people who need it and go straight into their spam folders. What’s an employer to do? As it turns out, recordkeepers have made huge strides in their data-crunching abilities in recent years, to the point that it’s easy to drill down and identify specific groups of plan participants – like those who are saving less than a certain percentage of their pay. Nowadays, it’s easy to send out a custom email campaign targeted specifically to low savers, complete with a personalized message for each participant. A company match is a powerful tool. Whether your focus is on recruitment and retention or retirement readiness, a retirement plan match is an extremely well-regarded and cost-effective benefit to consider. Believe it or not, 3 out of 4 employees prefer a 3% match over a 3% raise in pay. 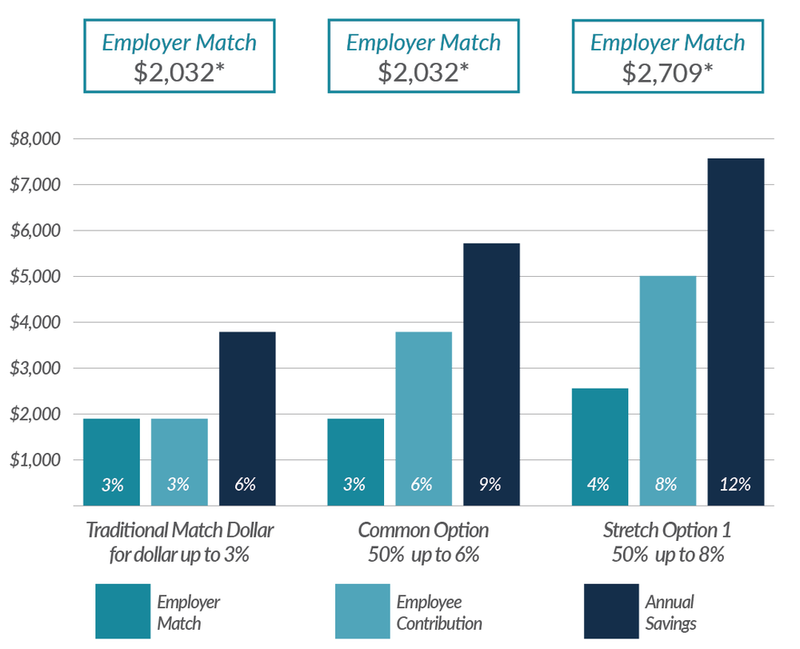 Many employees interpret the employer match as a guideline for how much they should save for retirement. Match 100% of the first 3% of pay an employee defers, for instance, and most of your employees will take it as a suggestion that they can save exactly 3% each year and have enough for retirement. Unfortunately, in most cases they will need to save much more. So, it is important that you find a formula to incentivize participants to defer a meaningful amount and meets your budget. Actual cost will be lower depending on your vesting schedule. 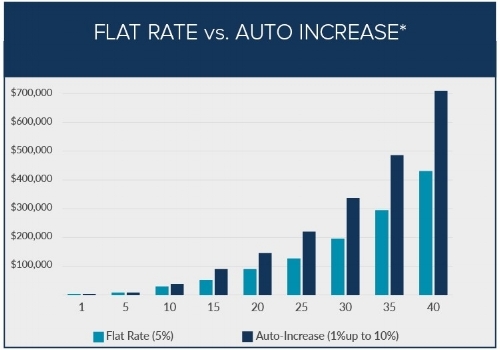 Auto features have become more and more commonplace these days: nearly 6 out of 10 plans have already adopted auto-enrollment, and three-fourths of those plans automatically increase default deferral rates over time. When discussing these powerful features with plan sponsors, we are often met with resistance, mainly because they fear pushback from their employees. It may rest your worried mind to know that 2 out of 3 of participants feel positive about a company that offers auto enrollment and automatic increases. What if you had the ability to automatically get new employees on track toward retirement? Employers that implement auto enrollment have seen participation rates increase from 47% to 93%. According to T. Rowe Price, the average default rate has reached an all-time high! For the first time ever, more plans have a default deferral rate of 6% than the previous industry standard of 3%. While this is a great start, many experts believe that Americans need to save 12-15% per year in order to achieve a comfortable retirement. We believe this is achievable by adding an auto increase feature to your plan; this plan design feature makes accelerated saving simple by slowing ramping up deferral rates each year, generally by 1-2% annually. The illustration shows a couple saving scenarios and how long it would take to get employees the recommended savings rate. Even if you implement auto-enrollment, it is possible that not all eligible employees are reaping the benefits. Most employers implement auto-enrollment only for new hires, so employees who were already with the company when auto-enrollment was first implemented got passed over. Also, some new hires may have opted out of enrollment when they first joined, or reduced their deferral sometime after being hired due to financial concerns; even if their financial state has improved since, most won’t take the initiative to sign up for participation on their own. Consider re-enrollment for all eligible employees either not currently participating in the plan or contributing less than the initial default deferral rate. If your initial default deferral rate is 6%, for example, re-enrollment would include non-participating employees as well as active participants, who are saving less than 6%. Some employers do re-enrollment as a one-time event; others do it every year. Which way makes the most sense depends on the company. Partner with us and we can help you implement these and other ideas to get your employees on track to a well-earned comfortable retirement. We can work with your recordkeeper to target campaigns to specific participants, help you choose the right deferral rate for your employees and budget constraints, figure out a match formula that optimizes employee contributions, and decide whether re-enrollment is right for your plan. ,2 American Century Investments. “5th Annual National Survey of DC Plan Participants.” Dec 2017. Greenan, Hattie.” PSCA Releases Results of 60th Annual Survey of Profit Sharing and 401(k) Plans.” 12 Feb. 2018. American Century Investments. “5th Annual National Survey of DC Plan Participants.” Dec 2017. Clark, Jeffrey W., and Jean A. Young. “Automatic Enrollment: The Power of the Default.” Vanguard Institutional, Feb. 2018. PLAN ADMINISTRATION IS A HASSLE....but does it have to be? …but does it have to be? As an HR professional, you have mastered the art of juggling and hopefully you look good in hats, because you’re likely to find yourself wearing a number of them in varying situations. Being the administrator of your 401(k) plan adds a few extra hats to the rack. Your role changes from accountant for payroll, to attorney when reviewing plan documents or a teacher for the plan participants. In this article we hope to lend some helpful information, tools and ideas that may help you manage your responsibilities as a plan sponsor and hopefully make your life a bit easier. Every payroll period, administrators are required to submit payroll and 401(k) contributions in a timely manner. If you are still taking a manual entry approach, you understand how arduous that process can be. Many administrators may feel like the middleman stuck between your payroll provider and recordkeeper, or a rock and a hard place. Fortunately, payroll is a process that can be automated and integrated to reduce potential data input errors and give you back valuable time. 180° integration — Your payroll provider and 401(k) recordkeeper are integrated to share critical information on participant contributions. Data flows automatically from payroll to the recordkeeper, but only in one direction. Think of this like a 1-way street. 360° integration — Similar set up as 180° integration, but data flows in both directions between the payroll firm and the 401(k) recordkeeper, like a 2-way street. Third Party Services — You could alternatively choose to delegate the responsibility to a Third Party. This would be similar to calling an Uber to get you where you need to go, you don’t have to worry about which streets go which direction. One of the most heavily utilized and referenced items on that list is a condensed version of your plan document, a “Summary Plan Description”. An SPD is a summary of the key features of your 401(k) plan and eases understanding, allowing its use for participant education and administrative reminders as needed. We have developed an abridged version that outlines some of the most referenced items such as eligibility timeline, enrollment periods, and distributions. Download our free template by clicking the button below. How often are you approached with technical questions about your company’s retirement plan? Did you know that the simple act of discussing certain aspects of the company retirement plan with your employees could open you up to fiduciary risk? This a job for your advisor, not a burden you should have to bear. We understand that vesting schedules, risk tolerance, retirement income replacement ratios, social security integration, and non-qualified deferred compensation contributions are not your full-time job. As Retirement Specialists, this is what we do! We are licensed and available to answer the complex questions your employees may have. Many of the tasks involved in plan administration can seem time consuming, tedious or just an outright pain in the neck at times. However, we like to look at these responsibilities as a safeguard and believe that, if done right, they may help you dodge fiduciary nightmares. For more information on how Financial Management Network can help relieve some of your administrative stress, contact us today! [i] Donaldson, David. “Plan Management: Through the Eyes of a Former DOL Senior Investigator.” ERISA Smart. 2015. [ii] Wagner, Marcia. “Legal Update: Tussey vs. ABB, Inc.” Jan. 2015. The Top DC Advisor Firms is an independent listing produced annually (September 2017) by The National Association of Plan Advisors(NAPA). The NAPA Top DC Advisor Firms is a compilation of leading individual advisor Firms, or teams, ranked by DC assets under advisement. This award does not evaluate the quality of services provided to clients and is not indicative of this advisor’s future performance. Neither the advisors nor their parent firms pay a fee to NAPA in exchange for inclusion on this list. 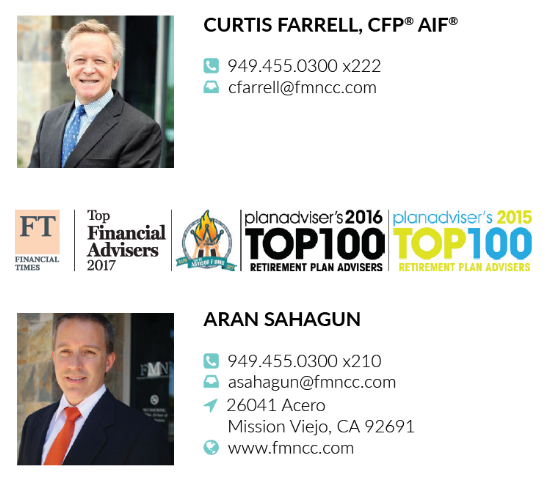 The “Top 100 Retirement Plan Advisers 2016” list by PLANADVISER Magazine recognizes individuals, teams, and multi-office teams according to quantitative measures, including the dollar value of qualified plan assets under advisement as well as the number of plans under advisement. Nominations were solicited online from retirement plan advisers, their employers and/or broker/dealers, and plan sponsors, as well as from working partners of these advisers, including investment vendors, accountants and attorneys, and pension administrators. Over our years working with business owners and employers, we’ve encountered a number of common myths that plan sponsors hold on to despite proof to the contrary. These myths can be harmful to plan sponsors and employees alike, and here we aim to debunk some of the most frequently occurring offenders. Myth #1: “We’re all set.” Plan sponsors use this phrase often to describe their level of satisfaction with their plan. It also serves as a roadblock to any discussion regarding potential improvements to their retirement plan offerings. “We’re all set” – “everything is fine; nothing needs to be changed.” Unfortunately, this is generally anything but the case. There are two key elements that demand careful examination: fiduciary awareness and retirement readiness. 1. Are you named in plan documents as a fiduciary? 2. Do you exercise control over the management or administration of the plan or its assets? 3. Do you provide ongoing investment management or advice to the plan or plan participants? 4. Do you select or supervise other plan fiduciaries? 5. Do you sit on a committee that manages the plan? What are my responsibilities as a fiduciary? 1. Act solely in the interest of plan participants and their beneficiaries. 2. Prudently carry out your duties. 3. Follow plan documents (unless inconsistent with ERISA). 5. Pay only reasonable plan expenses . This startling gap in confidence might stem from many factors. Many employees might simply not know enough to accurately evaluate their financial situation; 81% of Americans say they aren’t sure how much money they'll actually need in retirement. Alternately, they might believe that plan sponsors are solely responsible for their retirement: during a recent employee education meeting, we were approached by an employee who asked, “isn’t the company required to pay for everything?” After addressing the employees’ misconceptions, we worked with the plan sponsor to implement automatic plan design features and rolled out a more robust employee education program to help motivate savings. As a plan sponsor, you control one of the most powerful savings vehicles available to your employees. To help your employees harness that power, you might consider enhancing your plan with Auto-Increase, or an enhanced employer matching formula. Auto-Increase allows participants to automatically increase contributions little by little each year– typically by 1%. One percent per year may not seem like much, but it adds up over time! *This illustration uses a hypothetical 7% rate of return. It is not representative of any specific situation and your results will vary. The hypothetical rate of return used does not reflect the deduction of fees and charges inherent to investing. If your plan uses a typical match formula of dollar-for-dollar up to 3% of pay, you might want to consider Stretching the Match. For example, you could match fifty cents on the dollar up to 6% of pay. This simple scenario would increase employee savings while keeping employer contributions the same (3% of pay). Understanding and fulfilling your fiduciary duties and moving your employees toward retirement readiness are two ways to help ensure that your plan truly is “all set.” But these aren’t “one-and-done” tasks. We work closely with employers to help them meet their fiduciary duties and keep their employees educated and engaged. For more information on how Financial Management Network can help you build a prudent fiduciary process and dynamic employee education, contact us today! AllianceBernstein L.P. " Inside the Minds of Plan Sponsors" A/B Research. Dec 2017. Department of Labor. “Meeting Your Fiduciary Responsibilities.” DOL.gov. Sept. 2017. BlackRock. “2018 DC Pulse Survey.” March 2018. Age Wave/Merrill Lynch, "Finances in Retirement: New Challenges, New Solutions," 2017. Could Education Debt Shrink Your Social Security Income? $1.1 billion has been garnished from retirement benefits to pay back old student loans. Do Our Attitudes About Money Help or Hurt Us? We may need to change them to better our financial prospects. Retirement Planning for Single Parents. It is a challenge – and it must be met. How does a single parent plan for retirement? Diligently. Regularly. Rigorously. Here are some steps that may help, whether you are just beginning to do this or well on your way. Setting a household budget can be a wise first step. Most households live without budgets – and because of that financial inattention, some of the money they could save and invest routinely disappears. When you set and live by a budget, you discipline yourself to spend only so much and save (or invest) some of the rest. You need not track every single expense, but try and track your expenses by category. You may find money to save as a result. You may want to invest less aggressively than you once did. Young, married couples can take on a lot of risks as they invest. Divorcees or widowers may not want to – there can be too much on the line, and too little time left to try and recoup portfolio losses. To understand the level of risk that may be appropriate for you at this point in life, chat with a financial professional. There may be great wisdom in “setting it and forgetting it.” Life will hand you all manner of distractions, including financial pressures to distract you from the necessity of retirement saving. You cannot be distracted away from this. So, to ward off such a hazard, use retirement savings vehicles that let you make automatic, regular contributions. Your workplace retirement plan, for example, or other investment accounts that allow them. This way, you don’t have to think about whether or not to make retirement account contributions; you just do. Is This the Season to Change Jobs? The top financial considerations for those ready to make a move. Are you saving for retirement? Great. Are you planning for retirement? That is even better. Planning for your retirement and other long-range financial goals is an essential step – one that could make achieving those goals easier. Saving without investing isn’t enough. Since interest rates are so low today, money in a typical savings account barely grows. It may not even grow enough to keep up with inflation, leaving the saver at a long-term financial disadvantage. Investing without planning usually isn’t enough. Most people invest with a general idea of building wealth, particularly for retirement. The problem is that too many of them invest without a plan. They are guessing how much money they will need once they leave work, and that guess may be way off. Some have no idea at all. Growing and retaining wealth takes more than just investing. Along the way, you must plan to manage risk and defer or reduce taxes. A good financial plan – created with the assistance of an experienced financial professional – addresses those priorities while defining your investment approach. It changes over time, to reflect changes in your life and your financial objectives. With a plan, you can set short-term and long-term goals and benchmarks. You can estimate the amount of money you will likely need to meet retirement, college, and health care expenses. You can plot a way to wind down your business or exit your career with confidence. You can also get a good look at your present financial situation – where you stand in terms of your assets and liabilities, the distance between where you are financially and where you would like to be. October is National Financial Planning Month – an ideal time to plan your financial future. The end of the year is approaching and a new one will soon begin, so this is the right time to think about what you have done in 2016 and what you could do in 2017. You might want to do something new; you may want to do some things differently. Your financial future is in your hands, so be proactive and plan. Trustee-to-trustee transfers of retirement plan money occur without being taxed. In a rollover of this kind, the custodian financial firm that hosts your workplace retirement plan account makes a payment directly out of the account to an IRA you have waiting, with not a penny in taxes levied or withheld. Trustee-to-trustee transfers of IRAs work the same way. Will millennials face a retirement crisis in their fifties and sixties? Is Your Adviser a Butcher or Dietitian?? Here's a fun video describing the difference between a broker and a fiduciary. The takeaway.... most people think when they see their adviser that they're talking to a dietitian, when in reality they're taking to the butcher. Is Cooking Cheaper than Eating Out?